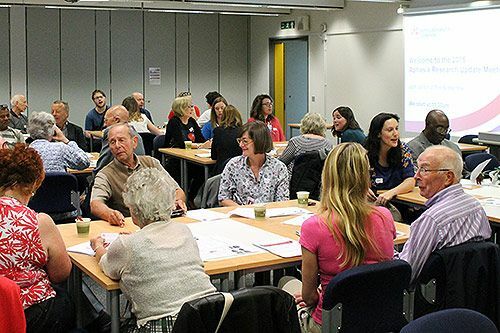 A recent event at City University London brought together academics and people with aphasia to share the results of research and get their thoughts on where it should be headed next. Aphasia, a communication disability that can impair speaking, understanding, reading, or writing, is a key area of research for City's Division of Language and Communication Science (LCS). Approximately 30 per cent of the 150,000 people in the UK affected by stroke each year will be left with aphasia. Involving around 30 people with aphasia along with staff and students from the Division of Language and Communication Science, talks started by covering two current aphasia research projects - called CommuniCATE and LUNA - both of which are on-going and still looking for participants. Launched formally earlier this year in February, CommuniCATE aims to deliver technology-enhanced therapies to people with aphasia. A joint venture between LCS and the Centre for Human Computer Interaction Design at City, the therapies developed by the CommuniCATE project target reading, writing and speech. Research speech and language therapist Katie Monnelly briefly demonstrated some of the different technologies – ClaroRead, Dragon Dictation, Skyps, Aphasia ScriptsTM – being used in CommuniCATE. Focusing on a different strand of therapy, the LUNA (Linguistic Underpinnings of Narrative in Aphasia) project aims to bring language and discourse together with identity, with seed funding from the British Aphasiology Society Working with seven people with aphasia - and now looking to start another tranche with four more - the LUNA team worked to enable people with the condition to tell their story, working with them to revise and choose words and sentences until the person with aphasia is happy with their story. Dr Lucy Dipper outlined the linguistic improvements people had made, and the impact documentary film, funded by the School of Health Sciences Research Sustainability Fund, will be publicly available soon through YouTube. After introducing the current research projects, attendees – who were all seated on a table with an academic or trainee speech and language therapist – discussed future directions for research, giving their opinions on what they would like to see researched next. After a lunch where people chatted about the projects, staff and PhD students from LCS spoke about their completed projects. The first of these was one by Line Huck, which involved using eye tracking technology to investigate sentence reading in aphasia. Including 19 people with the condition and 20 without, Line found that eye tracking can assess reading difficulties and showed the importance of semantic skills and working memory for reading. Next Dr Sarah Northcott and Dr Katerina Hilari spoke about their solutions focused brief therapy project titled ‘living with aphasia the best way I can’. Involving five participants over four therapy sessions, the project involved an approach to building change, focusing on what is already working for people with aphasia and their strengths. It also involved encouraging people to describe their ‘preferred future’ leading to small, meaningful goals. The results were positive, with many feeling increased confidence in talking. The team are now applying for more funding to carry out a larger study. Becky Moss then spoke about her writing and reading with computer software project, which involved ten people with aphasia. As people with aphasia find writing and reading difficult but speaking and understanding easier, Becky used software such as Dragon NaturallySpeaking and ClaroRead to help them with writing and reading. The results are currently being written up and are part of Becky’s PhD. Lastly, Madeleine Pritchard spoke about measuring discourse in aphasia. The project involved 17 speakers with the condition and 60 speakers without, finding that speech and language therapists should use story grammar for measuring the information in discourse. Those wishing to learn more about the projects can view them online at www.tinyurl.com/CityAphasia or follow #CityAphasia on twitter.